Grab a jacket before you head out Friday morning. A cold front moved through the region, dropping temperatures into the 60s Friday morning. 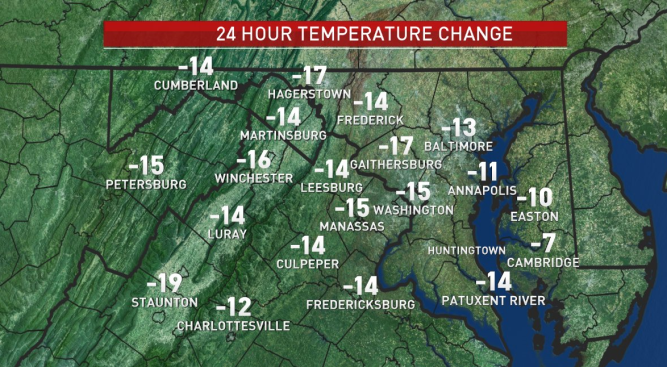 Storm Team4 meteorologist Amelia Draper says the temperature dropped 15 degrees in the Washington, D.C. in 24 hours. A wind advisory is also in effect for the D.C. area until noon Friday. Scattered showers with patches of heavy rain fell Thursday afternoon and into the evening. The overnight weather prompted schools in Spotsylvania, King George and Stafford counties in Virginia to open two hours late Friday. In Maryland, Charles and St. Mary's counties opened two hours late.